Psst...I don't think Seward was a fool, do you? So as you may know, I do love me some good old history. So today's step back in time is all the way back to 1867. Any guesses what happened in 1867? I am sure a ton of things happened that year, but the event I am talking about is Alaska being purchased from the Russian Empire on March 30, 1867. So before that date, Alaska was part of Russia! Crazy, right? Secretary of State, William H. Seward, purchased Alaska for $7.2 million. Now, back at that time, most of Alaska was unexplored - no one really knew what was in Alaska or what the land had to offer, so many called the deal "Seward's folly." Folly means foolishness, so many thought Seward was a fool for buying Alaska. Just makes you want to get outside, huh? is so large. It is actually the largest state in the United States. Gold was discovered there in the 1880's and 1890's. 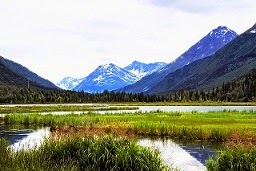 Tall mountains, shimmering lakes, thick forests, and wild animals are abundant in Alaska. Really, Alaska is a place of adventure and exploration. I would love to one day travel there, but for now, I must settle with reading about all the wonders Alaska has to offer. And guess what - we have a whole bunch of books on the state here at the Roselle Public Library, so I can read my little heart out. Once I am done reading, I am heading out the front door and going exploring. You never know what you might find.